Photometer for illuminance and luminance. Features: Mobile light meter with illuminance and luminance detector for use with polychromatic radiation sources. X9-1-US version for measurement of the illuminance in fc and luminance in fL. The VL-3704-4 Illuminance detector is fitted with a precise photometric correction filter and cosine diffuser. It’s V(λ) spectral sensitivity matches the DIN CIE standard f1’ error to equal or better than 5% meeting the DIN Class B specification. Its 20 mm low profile height allows measurement close to the reference level. The LDM-9901-4 Luminance detector is designed with a chromatically corrected lens for a measurement distance independent V(λ) match of f1’ error equal to or better than 5% to the DIN CIE standard. Its field of view is 1.1° with a measurement distance range 40 cm to infinity. To target the object to be measured, the LDM-9901 has a notch and bead sight which has marks for near and far field distances. 1 meter is a hand-held battery operated meter with 9 mm high character LCD display for easy viewing. Its high linearity current to voltage amplifier offers automatically (Manual?) selected gain ranges. Operating the X91 is simple. Once set-up all settings are stored and recalled on next power-up unless settings are changed. The light detector connected is recognized by the meter and set to the associated measurement quantity. The meter is operated by a standard 9 V battery. 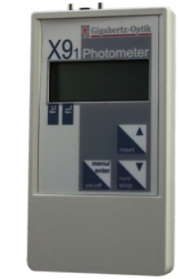 The US version of the X91 (Xnine one) meter plus VL-3704-4 and LDM-9901-4 light detector measures illuminance in footcandles (fc) and luminance in footlamberts (fL).